After guiding India to a historic ODI series win over Australia, skipper Virat Kohli spends his off-day by meeting with legendary tennis player Roger Federer in Melbourne on Saturday. Australian Open 2019: After leading India to historic victories in the Test and the ODI series against Australia, India captain Virat Kohli found a new way to rejuvenate himself and lift his energy levels ahead of the next assignment. While enjoying some time off from their hectic schedules, Kohli and his wife Anushka Sharma spent a day relaxing at the iconic Melbourne Park. 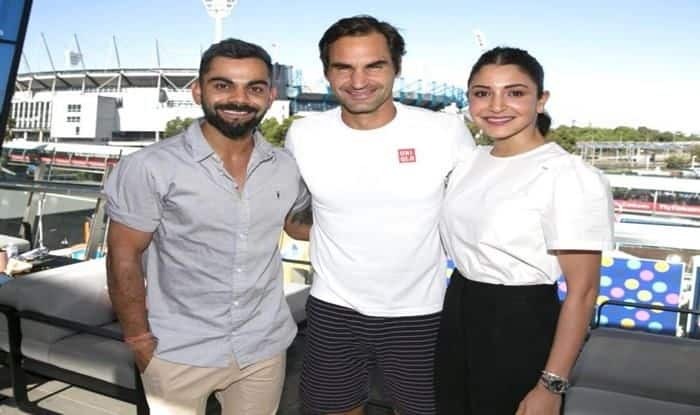 The Indian duo also posed with tennis legend Roger Federer, who are currently taking part in the Australian Open 2019. The couple posted pics on their respective Twitter handles and also shared some shots from the day’s play. Just like his batting, the Indian skipper left no stone unturned to sign off in the most stylish way possible. “What a day at the Australian open. ??????? An amazing way to finish the Australian summer. Forever grateful???? ?#ausopen,” Kohli tweeted along with a series of pictures from Australian Open. In the past as well, the 30-year old Kohli has expressed his admiration for the Swiss maestro, who is chasing his 21st Grand Slam title at the ongoing Australian Open. Kohli shared a selfie with his wife along with other pictures from the first Slam of the seasson. It seems that the couple watched Serena Williams beat Dayana Yastremska and Novak Djokovic’s win over Denis Shapovalov. Kohli became the first India captain to lead the Asian giants to a Test and an ODI series simultaneously on the tour to Australia. In 2015, Kohli, who had met Federer at the Australian Open, had described his earlier meeting as the day he would “never forget”. Notably, Federer will take on in-form Greece youngster Stefanos Tsitsipas in the fourth round of the Australian Open on Sunday. The 37-year-old hasn’t dropped a set yet in the ongoing tournament despite being troubled by Daniel Evans in the second round. On the other hand, Kohli along with the Team India will be heading to New Zealand for a five-match ODI series, starting January 23 in Napier.